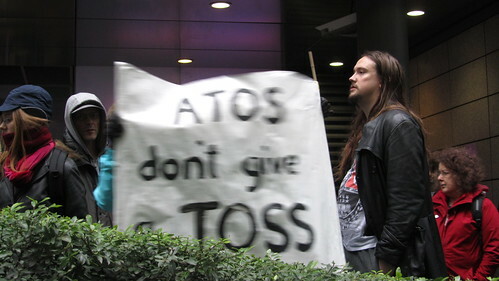 Hi, have just been emailing MP’s after seeing a list of ATOS assessment centres. Truro has no lift and yet is on the first floor. Another 28 centres are stated as NOT being wheelchair accessible! Disgusting and ludicrous! Triton Square is a fab place for a protest. There’s shelter if it rains or is too sunny, there’s things to sit on and there’s a couple of cafés a few yards away for acquiring refreshments and using their loos. Evidence needed for House of Commons Transport Select Committee: East Midlands Bus services cuts Lies, damn lies and DWP statistics!